Sidney Crosby hasn't been on the ice for the highs and lows Pittsburgh has experienced this week. Emotions, though, will certainly surge again for the Penguins in the playoffs, where their captain's health could determine their fate. The Penguins, who were able to clinch a playoff berth one game after a lackluster loss to the New York Islanders, will have Crosby back for the first time in eight games when they conclude their season series with the Isles on Thursday night. Pittsburgh (44-26-7) has won five of its last seven without Crosby, including a 2-0 victory over New Jersey on Tuesday night that secured a postseason spot for the Penguins. Crosby, who has missed 28 of the Pittsburgh's last 31 games because of a high ankle sprain, is expected to play Thursday. Crosby missed 21 games after getting injured against Tampa Bay on Jan. 18, then came back to play three contests early in March. But he experienced soreness after returning, and decided to give the injury more time to heal. Pittsburgh has gone 16-8-4 this season without Crosby, who has 22 goals and 45 assists in 49 games. 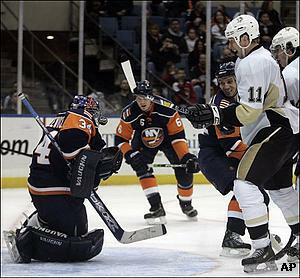 One of the Penguins' defeats during that span was a 4-1 loss to the Islanders on Monday night, which kept Pittsburgh from securing a postseason spot. The Penguins, though, bounced back less than 24 hours later against the Devils, increasing their lead in the Atlantic Division to four points over New Jersey and putting themselves in position to challenge for the top seed in the Eastern Conference. Pittsburgh is one point behind East-leading Montreal with five games remaining for both teams. "Everyone is thinking about trying to finish on top," Penguins winger Ryan Malone said. "We have to keep striving in that direction." If Pittsburgh can earn the No. 1 seed and have Crosby healthy entering the postseason, it could be set to make its best run since losing to New Jersey in the Eastern Conference finals in 2001. Crosby will center a line that includes high-scoring winger Marian Hossa, acquired from Atlanta at the trading deadline. Hossa was out with a knee injury when Crosby made his brief return. A healthy Marc-Andre Fleury is also critical to the Penguins' hopes. Fleury has won five straight starts and is 7-1-0 with a 1.48 goals-against average since returning from a high ankle sprain that kept him out 35 games. He stopped 16 shots in the third period versus New Jersey en route to his fourth shutout of the season and 11th of his career. Fleury is 1-1-0 with a 2.54 GAA in two games against the Islanders (34-36-7) this season, but Ty Conklin got the start and struggled in Monday's contest. Bill Guerin had a goal and assist in the second period for New York, which was eliminated from playoff contention in a 4-1 loss to Philadelphia on Sunday night. Each of the Islanders' final five games are against teams in playoff position in the East. "I hope every team takes us a little bit for granted," said New York's Wade Dubielewicz, who has allowed just one goal in each of his last two games. "We have a feisty group in here." The Islanders were able to generate offense against Conklin and the Penguins after scoring two goals or less in 11 of their previous 16 games, going 5-11-0 in that span. Mike Comrie, who leads New York with 49 points (21 goals, 28 assists), may return Thursday after missing one game with the flu. 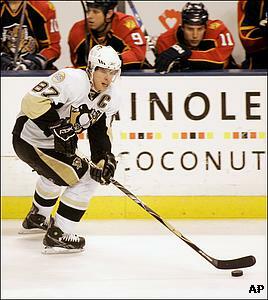 He was one of three Islanders to play in the team's first 76 games. Comrie has totaled three goals in his last three road games against Pittsburgh. The Penguins lead the season series with the Islanders 4-3-0.